Ohhh.. gives me the creeps these are so good. 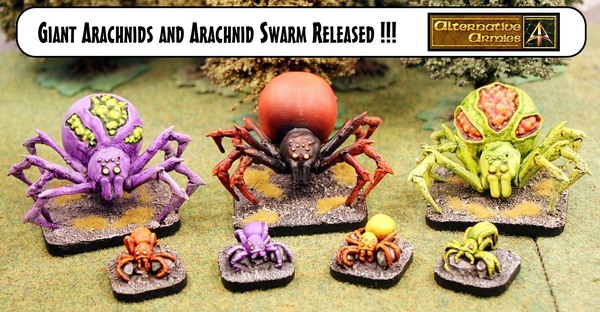 Now released two packs of Arachnids great for any scale from 28mm down to 15mm and 6mm. Giant Spiders and Spider Swarms for your games. Great for High Fantasy and many other settings. You can get packs or singles from packs. Sculpted by Kieran Billings who created the Space Brains and Sandworms among other things. Remember the March to War mega event is on and that means 10% off the entire website (including this release) and free shipping worldwide on 20GBP or greater in cart. This entry was posted on Thursday, April 4th, 2019 at 17:08 and is filed under News. You can follow any responses to this entry through the RSS 2.0 feed. You can skip to the end and leave a response. Pinging is currently not allowed.